Video not working? Click Here and try again. The Teacup Dog Walk conforms to competition standards for TDAA Teacup Dog Agility, but is not for TDAA only! It is great for practice in other venues with your small to medium dog, including puppies. To see if this dogwalk is right for your dog click here. We thought of everything when designing this great obstacle! Weather proof all plastic design – will not rot - minimal maintenance. Lightweight yet sturdy and solid – each plank is only 13lbs. Easy set up and take down - transports and stores easily. Quick and easy height changes – write on chain tabs provided. Quick release hinge pins - planks detach easily. Anti-bounce supports come standard – provides stability. Traction treated planks – infused into paint and gentle on paws. Board gap foam inserts provided – safer for dogs paws. UV resistant pvc pipe – lasts longer in strong sunlight. Visual instructions with training tips – with lots of pictures. Ships via UPS! – no freight trucks necessary. Our product development team thought long and hard about you and your dog when designing this dogwalk. Countless hours were put into engineering, developing, and testing it until we got it just right. We have developed a clever way to send this large obstacle via UPS. This dog-walk comes pre-painted, traction treated, and partially assembled. It will require some initial assembly. We provide complete assembly instructions with step-by-step directions with pictures. Once initially assembled, setting it up for use, and taking it down for transport and storage, is a breeze! You can purchase from us with confidence! 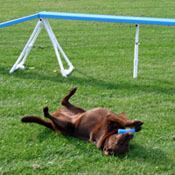 We're a leading supplier of agility equipment in business for more than ten years. If you have questions or need help, our knowledgable, friendly staff will be happy to assist - before, during, or after your purchase! To order: type quantity & add to cart. IMPORTANT: Please read and understand additional product information and specifications prior to making your purchase. Click here to view now. Everything you need to resurface this obstacle with a soft and attractive rubber surface. Available for your used or new equipment. Get better traction and more speed! Click here to learn more.